Congratulations on choosing a carreer in Linux and Open Source! If you're just starting on the journey, I wish you all the best. I'm thrilled to hear that you've decided to pursue a career in Linux and open source software, and I hope that it brings you lots of success, both financially and professionally. However, and you knew that was going to be a "however", I hope you've decided to do this for the right reasons. Not that there's anything wrong with picking a career that's going to ensure a steady stream of income for the next several years, on which you are going to build not only your future but your family's future, but there's more to selecting open source as a career then just the money. So, are you going into open source for the right reasons? Back in 1985, Starship -- the band, not an actual starship-- released a song called, "We Built This City". Starship, if you are too young to remember, was the evolution of Jefferson Starship, itself the evolution of Jefferson Airplane. A rather messy legal battle accompanied said evolution but I won't bore you with that here. The song, "We Built This City," was written by Bernie Taupin, Martin Page, Dennis Lambert, and Peter Wolf, while the vocals for the song came from Grace Slick and Mickey Thomas. I tell you all this because, well, it takes as village, as they say, even when you're building a city on rock and roll. Since I mentioned a legal battle in the previous paragraph, I'd be remiss not to mention that Linux, the poster child for Open Source software, had it's own long running legal battle against a poser for open source, namely the company formerly known as "SCO". For the record the good guys won. When people try to convince you that some moral point of view should grab and hold your attention, it's not uncommon to hear something to the effect that you should "do it for the children." Proponents of Open Source have long believed that free software can be a boon to children at every stage of development, both in terms of age, but also financially. Not far from where I live, there's the "Computer Recycling Centre", where volunteers take old computers, fix them up, load up Linux (usually), and make them available to people who otherwise could not afford them. In 2005, Nicholas Negroponte spoke at the World Economic Forum in Davos, a purportedly non-profit organization represented by some of the richest people in the history of this planet. Negroponte was there to champion a project to elevate children of distant African villages into participants of the great global village, the Internet. 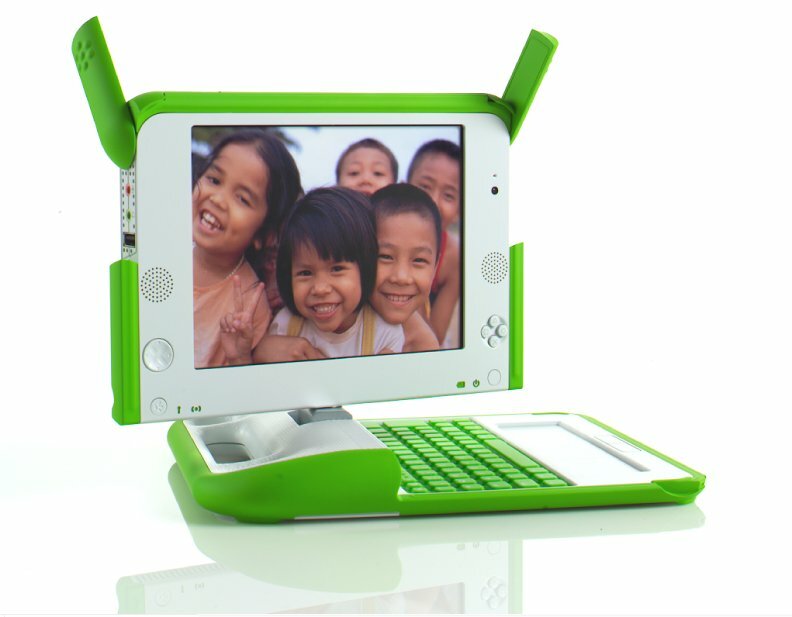 This ambition child-oriented open source project was OLPC, or "One Laptop Per Child". Much has been written about this bold and grand plan to create a small, insanely durable laptop, and to put untold numbers of these laptops into the hands of disadvantaged children around the world for $100 per laptop (see the image accompanying this article). The project never achieved its lofty goals for reasons that would fill a book, but it did leave some interesting DNA behind in the form of free software. Despite grand plans and a handful of bright green and white notebooks, the project never really achieved its goal of creating the $100 laptop, leaving behind tantalizing bits of open source DNA and some hard lessons about idealism in a world where questions about who counts the money while playing all those corporation games tends to rise above any attempt to put idealism first. The Internet itself, the greatest boon to the world's impressive economic engine, is built on open source idealism. Powered by countless Linux servers in enormous corporate clouds, backed up by open protocols, open source domain and routing services, open source email, open source file sharing, open source Web services, and open source pretty much everything, the idealists of open source built the Internet. Even more tantalizing is that with open source powering this economic behemoth, business has wrapped itself in the mantle of open source, generating billions upon billions of dollars and defining, through the awesome power of their wealth, the shape of the world in which we live. Except that we built this city. When viewed through the lens of the early creators of open source technology, we see a world where the technical and technological power of a handful of closed source companies (e.g. Microsoft, IBM, Sun) was reduced to a level playing field where anyone with the knowledge to code could, with freely available open source tools on a Linux system, create any kind of business (or world) they damn well pleased. In fact, we could imagine a world where open source was the norm and closed source was a kind of relic of an earlier age. When that day came, we would all be free to share in the wealth that was currently held by so few. Spoiler alert! We did it. Today, open source is ubiquitous, so much so that most people don't realize that they use open source every moment of every day they interact with the digital world. Those crazy open source idealists of 25 or 30 years past managed to create something out of science fiction, a world where you can talk to a little gray speaker on your kitchen table and have it tell you the weather, read you the news, tell you a joke, book an appointment, make a call, or ask who wrote "We Built This City" and then play you the song. But something happened on the way to the great open world of the future. A few powerful companies where born who knew how to take advantage of the work done by those open source idealists. Heck, some of them were, and may still be to some degree, open source idealists. Trouble is, the impact that people learning about and working with open source has steadily diminished. Those who count the money decide what happens next and most of us, myself included, are basically along for the ride. Back at the tail end of November of 2018, I read an article titled, "Millennials and Open Source: Don't Know, Don't Care?" and, as they say, it got me to thinking. Thinking about it makes me think of that old saying about those who forget history being doomed to repeat it. Understanding what makes open source special created the present we live in and gave us amazing super powers. Forgetting that means forgetting that you have those powers and letting only the rich and powerful decide what kind of world you will inherit. If you are going to work in this field, you most definitely should care, must care, about open source. We all need the money. Until we enter into that Star Trek universe where money isn't really used by most people, dinner makes it to the table by virtue of selling your skills to an employer. You learn Linux and open source, maybe specialize in DevOps, and insert yourself into a big company making a mint from open source. But remember that those tools, and the knowledge that you've learned along the way, allow you to build and create a world of wonders as amazing as anything that Google or Facebook or Amazon have built (with our help). If we don't like this city, we can build another, and another, because open source is power and, thanks for some great licensing foresight, we all own it. Build the next laptop for needy children the world over. Create a security system that protects privacy while delivering the good of the Internet. Think of a way to develop the next level sharing economy that will make your neighbours' poverty disappear as they share in the wealth that open source creates. Find a way, as you work at getting your paycheque, to recapture some of that wide-eyed idealism that comes with understanding that open source gives you the same power as everyone else regardless of how rich and powerful they are. Learn open source. Become a Linux god. Make money. But do it for the right reasons. Change the world.